We native people call them Swimmers, and they include Salmon People, Trout People, and many others. They make their homes in the lakes, rivers and creeks in our homeland of southern Oregon. We honor them with stories and ceremonies. 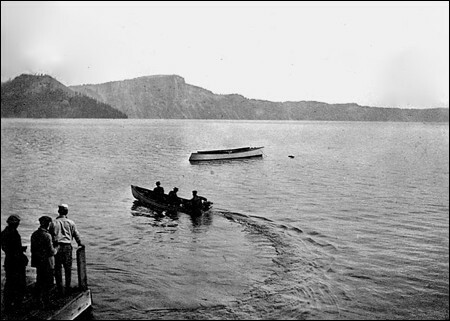 Until the 19th century, one place Swimmers never called home was Crater Lake. For centuries before that, there was Llao, a mythic monster crayfish who had a taste for Human People. He was at home in the lake. And from all accounts, he was plenty fat. The stories say so, and so it must be true. All fish in Crater Lake were introduced. 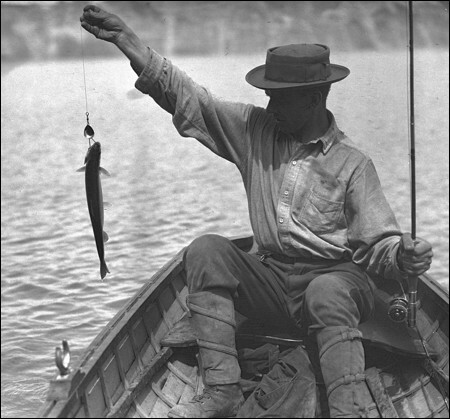 The lake was stocked with 1.8 million trout and salmon from 1888 to 1941. 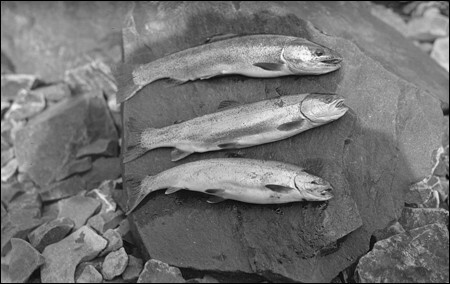 Of the six species introduced, only two species survive: rainbow trout and kokanee salmon. The National Park Service encourages folks to fish as much as they want. No license required, no limit, no length restriction. All those fish have done their part to add a bit of cloudiness to Crater Lake's pristine purity, shifting the makeup of the lake's ecosystem, and the park wants the fish gone. This storyteller wonders -- I can't help it! -- if the decline of fish in Crater Lake is only because of free fishing and no more stocking. Maybe something, or someone, is helping! Maybe an offspring of the monster Llao survives in the depths of the lake. To protect the People, Skell (a friendly monster) killed Llao, Sr. a long time ago. But maybe he had a kid, and Llao, Jr. lives on. Maybe he got tired of grabbing Indians off the rim with his giant pincers like his father had done. And maybe he discovered fish were easier to catch and digest. I mean, think about it! For over half a century, new arrivals in the neighborhood dropped tasty tidbits into his lake like a kid over-sprinkling a big blue aquarium with too much food. Maybe Llao, Jr. is a really big Llao kind of guy now, and he's doing just fine. There's another critter to consider. In 1914, the same folks that filled the lake with fish also introduced Signal Crayfish to Crater Lake. As if one giant crayfish wasn't enough? Maybe once the fish are gone, Llao, Jr. will have no problem eating miniature versions of his own kind. That would make the newts happy. Mazama Newts are as native to Crater Lake as Llao is to our mythology. Unfortunately for them, Signal Crayfish find them munchable. Here's one last thought. Maybe a few mouthfuls of fish ought to stick around, or perhaps a snack of Signal Crayfish. Not enough to adversely affect the lake. The other million or so can go away! Just enough to keep the monster's belly full. Otherwise, Llao, Jr. might start sharpening his pincers as he eyes a couple of park visitors hanging out on the rim. As they meditate on the beauty of that one-of-a-kind shade of blue, as they take in the stillness and the silence, as they contemplate the romance of this place under a full moon at sunset, they're unaware that a monster lurks in the depths. Just below them. And he's got big pincers! The stories say so, and so it must be true. 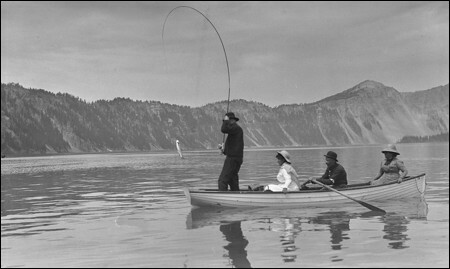 The first photo shows my grandparents doing their part by fishing in Crater Lake in 1910. 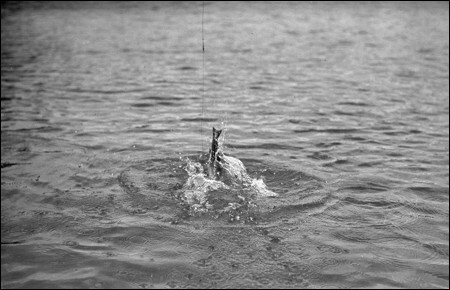 The other fishing photos were taken by Oregon wildlife photographer and writer William L. Finley during a 1913 visit with family and friends.